This statistic shows the extent to which UK consumers thought that paying to stream music represented good value for money in 2012. 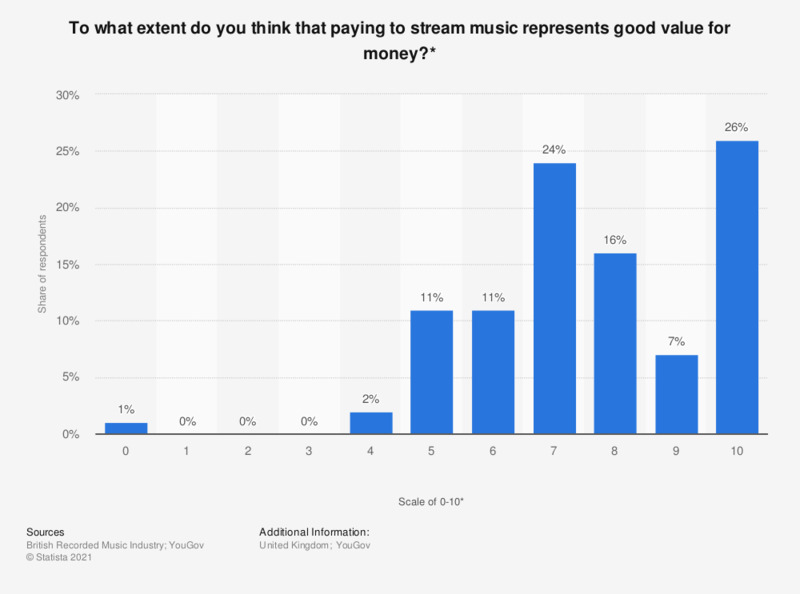 According to YouGov, 26 percent of respondents ranked paying to stream music a 10 on a scale of 0-10, that is, extremely good value for money. * Pariticpants were asked to answer on a scale of 0-10, with 0 being not at all good value for money and 10 being extremly good value. ** Some information regarding survey methodology and sample size can be found here . Date of survey was not given. Type of survey was not given. Age of participants was not given. How often do you stream music on Spotify?